We all have our hobbies. The things we indulge in after a long, tiring day at work. Haven't you noticed yet that they are so relaxing? If you don't have any hobby, try to find one for yourself and make it a habit to work on it often. Whether you are a crocheter, a painter or an embroiderer, being crafty can benefit your mind and body. 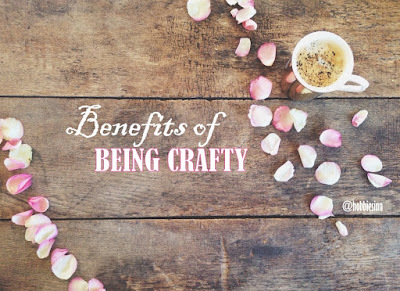 Research shows that being crafty can have health benefits. If you have kids than you should encourage kids to be more creative and imaginative as crafts do have so many developmental benefits for children too. Keep reading, I have jotted them all. The repetitive motions of a craft like sewing or knitting can produce a calming effect which is almost equivalent to meditation. The anxiety disorders are on rise. Being crafty can help improve the condition of a person suffering from anxiety. Repetitive and constant motions of crafts develop a rhythm and this rhythm can help people with anxiety disorders. Knitting therapist Betsan Corkhill surveyed 3454 knitters and more than half of them said they felt very happy after knitting. Many of them stated that they knitted specifically for relaxation and stress relief, and those who knitted more frequently reported more mental and emotional relief than those who did it less frequently - they reported feeling calmer, happier, less sad, less anxious and more confident. 3. Improves Problem Solving and Mindfulness. Doing stuff together with friends can aid in mind and brain wellness. It improves the capabilities of problem solving and attentiveness. Moreover being crafty helps in development of hand-eye coordination. Being crafty can also give you a sense of pride and achievement. It can boost ones mood, induce happiness and increases persons self-esteem, patience and perseverance. 5. Helps People with Eating Disorders. A small study performed in Canada focused on people with Anorexia Nervosa. Many of these women were given free knitting lessons and a research was conducted that showed [and many of them agreed] that taking lessons reduced their fears of eating. 6. Prevents Your Brain From Ageing Quicker. This may seem weird but when we are being creative, our brains release dopamine, which is natural anti-depressant. Studies shows that crafting activities help in delaying brain aging by reducing stress and improving mindfulness. Creative activities even help in alleviating depression. 7. Has developmental benefits for children. Developing creativity in children provides a stable foundation for future learning. Helps children with their confidence and self-esteem. Its something that they don't have to about grades and can express themselves in best possible manner.
" When we are involved in creativity we feel that we are living more fully than during the rest of life. You know that what you need to do is possible to do, even though difficult, and sense of time disappears. you forget yourself. you feel part of something larger." As a child I have always been into crafts. As an adult I blog about them. I can tell you by personal experience that, it works. I have too many hobbies and I enjoy each one of them. As a matter of fact I never get bored. Being bored is not in my dictionary. [Because it is being crafty, always]. Think about something you would love to invest your time into. Maybe it is crocheting, Sketching or even cooking. Doesn't it always make you feel great? Doesn't it de-stress you? Don't you get happy? Well, than what are you thinking? Wanna try crocheting?